As you'd expect the Canon EOS-1D Mark IV showed very good color accuracy, as well as fairly accurate saturation levels. Hue accuracy was quite good, with small hue shifts occurring in the aqua, cyan, reds, oranges and yellow. Average "delta-C" color error was only 4.35 after correction for saturation, which is excellent; among the best we've tested. (Delta-C is the same as the more commonly referred to delta-E, but delta-C takes into account only color differences, ignoring luminance variation.) Average saturation was 112.1% (12.1% oversaturated), a bit more vibrant than some professional SLRs (that seems to be the trend these days), but still very good. Mouse over the links below the illustration above to compare results with other professional models. 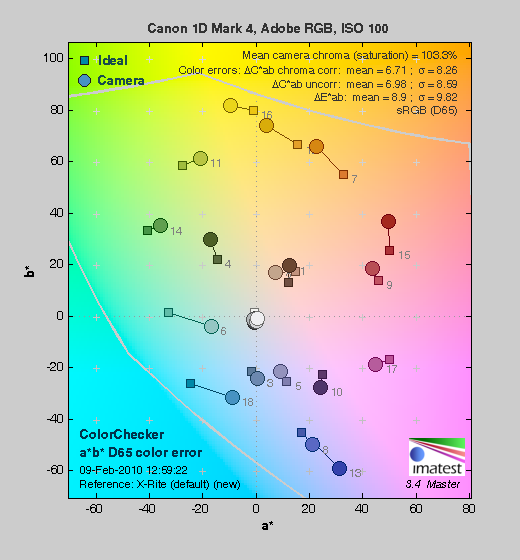 Unlike most other cameras, the Canon 1D Mark IV delivers less saturated colors when using the Adobe RGB color space (which provides a much wider gamut, or range of colors that can be expressed). Average saturation was 103.3%, which is lower than the sRGB results by 8.8%, but more true to life. Average saturation-corrected hue error was 6.71 "delta-C" units, less accurate than the sRGB result, but still not bad. Again, mouse over the links below the illustration above to compare results with other professional SLRs. 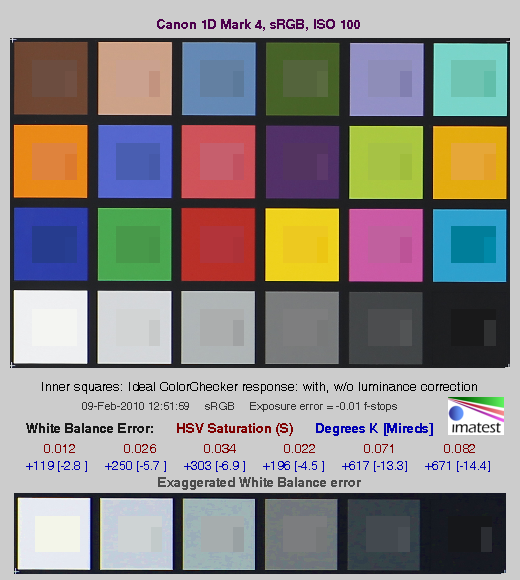 The bottom row of the chart shows exaggerated white balance errors, revealing that the camera produced a very slightly cool color balance when using Custom white balance, with a WhiBal card as the reference. White balance is actually pretty close to ideal though (note that the examples above deliberately exaggerate the white balance error). 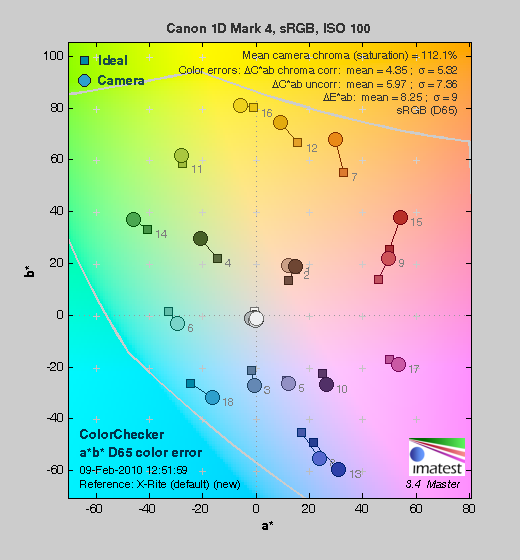 This chart compares the Canon 1D Mark IV's luminance noise performance at midtone grey density over a range of ISOs against that of other professional SLR models. While we continue to show noise plots of this sort because readers ask for them, we each time point out that the noise magnitude is only a small part of the story, the grain pattern being much more important. The graphic below shows the test results from Imatest for an in-camera JPEG file from the Canon 1D Mark IV with a nominally-exposed density step target (Stouffer 4110), with the camera's Highlight Tone Priority and Auto Lighting Optimization turned off, and contrast and other exposure-related settings at their default values. These are the dynamic range results of an in-camera JPEG at ISO 50. Normally, the native base ISO results in the best score, which would be ISO 100, but the 1D Mark IV produced a better score at the highest quality level at ISO 50. Here, we can see that the tone curve shows pretty good gradation in the highlights, but the shadow end trails off rather abruptly. A sharp tail-off at the shadow end usually signals plugged shadows and lost detail in images, but the 1D Mark IV showed no such behavior at low ISOs. There's clearly more gradation at the highlight end of the tonal scale, but examining deep shadows on the 1D Mark IV's test images showed excellent detail, in all but the very darkest shadows. Total dynamic range reported is 9.38 f-stops while dynamic range at the highest quality level is 8.1 f-stops. Here are the same results at ISO 100, the Mark IV's true base ISO. As you can see, total dynamic range is slightly better than ISO 50 (9.67 vs 9.38 f-stops), but the score at the highest quality is a bit lower (7.61 vs 8.1 f-stops). This is no surprise, since noise is slightly higher at ISO 100 vs ISO 50, especially in the shadows. Processing the Canon 1D Mark IV"s RAW (.CR2) files through Adobe Camera Raw (ACR) version 5.7 increased dynamic range by about 0.8 f-stops at the highest quality level (8.9 f-stops), compared to the best in-camera JPEG (8.1 f-stops), while total dynamic range reported increased by over 1.5 f-stops from 9.67 to 11.2. These results were obtained by using ACR's automatic settings. Slightly better results are possible with manually tweaking, though we weren't able to improve results. It's worth noting here that ACR's default noise reduction settings reduced overall noise (see the plot in the lower left-hand corner) relative to the levels in the in-camera JPEG, which would tend to boost the dynamic range numbers for the high quality threshold. Also, the extreme highlight recovery being performed by ACR here would likely produce color errors in strong highlights of natural subjects. Indeed, recovered highlights in our step-chart showed a reddish tint in Photoshop. The net result was that the Canon 1D Mark IV's JPEGs scored near the top of all SLRs we've tested in Imatest's dynamic range analysis, while RAW files converted with ACR placed in the top tier. Excellent results. Comparing the Canon 1D Mark IV to the rest of the field, its dynamic range in camera-produced JPEGs much higher than average, even among professional models, bested only by the Canon EOS-1Ds Mark III. Adobe Camera Raw managed to boost dynamic range scores significantly, but as noted above, the extreme processing it's applying in the highlights would almost certainly result in color errors in strong highlights in highly-colored natural subjects; the actual dynamic range of the sensor is likely somewhere in between. The chart above shows consolidated results from spatial frequency response measurements in both the horizontal and vertical axes. The "MTF 50" numbers tend to correlate best with visual perceptions of sharpness, so those are what we focus on here. The uncorrected resolution figures are 2,116 line widths per picture height in the horizontal direction (corresponding to the vertically-oriented edge), and 2,605 lines along the vertical axis (corresponding to the horizontally-oriented edge), for a combined average of 2,361 LW/PH. Correcting to a "standardized" sharpening with a one-pixel radius reduced the resolution score by quite a bit, for an average of 1,838 LW/PH, indicating that the 1D Mark IV oversharpens its JPEG images at the default setting. To see what's going on, refer to the plots below, which show the actual edge profiles for both horizontal and vertical edges, in both their original and corrected forms. Here, you can see that an excessive amount of in-camera sharpening is applied in the horizontal direction with Imatest reporting oversharpening by 13.8%, while in the vertical direction, Imatest reports oversharpening of 6.9%. This is why standardized sharpening reduced the Mark IV's MTF 50 numbers by so much. 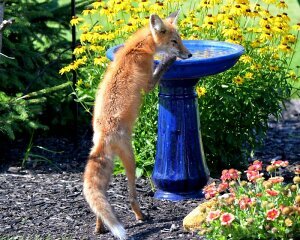 For best results from JPEGs, users should turn down the in-camera sharpening and sharpen images in post processing. As is almost always the case, you'll extract the most detail from the Canon 1D Mark IV images by shooting RAW and carefully processing its CR2 files. Note: We don't feature SFR-based LW/PH resolution numbers more prominently in our reviews (eg, outside the Imatest pages) because we've found that they're *very* sensitive to minor differences in in-camera image processing. Relatively small changes in the amount of in-camera sharpening can have a large effect on the resulting resolution numbers. Imatest attempts to compensate for this by adjusting to a "standard' sharpening, but this approach can't completely undo what happens inside the cameras, and so often gives inconsistent results. Sometimes the "standardized" sharpening happens to just match the shape of the edge profile with the in-camera sharpening applied, and you'll get wildly high results. At other times, it will tend to correct in the opposite direction. Unfortunately, ignoring the in-camera sharpening entirely can result in even greater discrepancies, particularly between models from different manufacturers. Turning off sharpening in the camera may or may not fully eliminate the sharpening, so simply turning off sharpening in the camera JPEGs isn't a reliable solution. It also wouldn't be the way most people shoot the cameras. We could process RAW files with no sharpening, but then that'd only suit the people working primarily or exclusively from RAW, and would open another can of worms as to what RAW converter was used, etc, etc.